The Food Safety and Inspection Service (FSIS) is responsible for ensuring that the nation’s commercial supply of meat, poultry, and egg products are safe for human consumption. The agency carries out inspections of slaughterhouses and meat-processing facilities, enforces correct labeling and packaging, and monitors recalls of tainted foods. There have been numerous prominent cases of FSIS failing to prevent contaminated meat from entering the commercial food supply, resulting in food poisoning of hundreds of Americans with some fatalities. The current Under Secretary of FSIS is Elisabeth Hagen. When President Abraham Lincoln founded the Department of Agriculture in 1862, he appointed chemist Charles M. Wetherill, to lead the Bureau of Chemistry, the early precursor to the Food and Drug Administration. In 1865 Congress passed legislation to quarantine imported animals, with the Treasury Department tasked to enforce the law. During this period, expanding railroads made it possible to transport livestock to markets for slaughter. Refrigerated train cars were introduced in the 1870s, and when electricity became more widely available, meat processing became a year-round business. The meat-packing industry thrived as larger quantities of livestock could be handled. However, there was little preventive action to maintain animal health, and various animal diseases spread. States tried to contain epidemics in their areas, but were ineffective. Many pushed for a national response to meat processing. On May 24, 1884, President Chester Arthur established the Bureau of Animal Industry (BAI), the precursor to the Food Safety and Inspection Service (FSIS). The function of the new agency was to prevent diseased animals from entering the market. Quarantine functions originally assigned to the Treasury Department were soon transferred to the BAI. Inspection stations were established in Baltimore, New York, Boston, and Philadelphia that worked with customs offices on the Canadian and Mexican Borders to guard against foreign animal diseases. As the United States placed firmer quarantine rules on imported animals, foreign countries also passed increasingly stringent restrictions on U.S. livestock and animal products, causing American exports to fall. American producers and packers urged the federal government to implement an inspection program that would allow them to better compete on an international scale. On August 30, 1890, the initial Meat Inspection Act was approved for salted pork and bacon intended for export, and was soon amended to cover inspection and certification for all live cattle to be exported, as well as live cattle that were slaughtered for export. The 1905 publication of Upton Sinclair’s novel The Jungle caused furor across the country as it vividly described the brutalization and exploitation of workers in the Chicago meatpacking district. In almost nauseating detail, the book depicted the threat to consumers of meat products. Sinclair urged President Theodore Roosevelt to provide federal inspectors for monitoring meatpacking houses. In 1906, Congress passed the Food and Drug Act, which created the Food and Drug Administration, and the Meat Inspection Act The Meat Inspection Act authorized the Secretary of Agriculture to inspect and condemn any meat product found unfit for human consumption. The USDA’s Bureau of Chemistry enforced the 1906 Food and Drug Act, while BAI’s Inspection Division took on the role of enforcing the Meat Inspection Act. Several federal departments, such as U.S. Navy, the Bureau of Indian Affairs, the Army, the Marine Corps and the Veterans Bureau, requested BAI inspections. In 1912, BAI also began to inspect eggs for the Navy before the USDA did so for the poultry market and the general public. In 1927, USDA’s Bureau of Chemistry was reorganized into the Food, Drug and Insecticide Administration, and was again renamed the Food and Drug Administration in 1931. The FDA was transferred from the USDA to the Federal Security Agency in 1940, which became the Department of Health, Education and Welfare in 1953, and is now the Department of Health and Human Services. After World War II, the meat processing industry changed drastically. The federal highway system and development of refrigerated trucks allowed meat-processing facilities to move out of urban areas. Increased competition led to increasingly mechanized factories in rural areas. The Eisenhower Administration enacted sweeping organizational changes at the USDA in 1953. Scientific bureaus, including the BAI and the Bureau of Dairy Industry, were abolished. Their functions were transferred to the newly established Agriculture Research Service (ARS). Explosive growth in the poultry industry forced Congress to pass the Poultry Products Inspection Act in 1957. This law allowed producers to meet demand for ready-to-cook poultry and processed poultry products, focusing on visible contaminations. Overall, the prevalence of animal diseases decreased. However the complexity of organizations, and the volume of processed products, resulted in increased concerns about mislabeling and adulteration. In 1958, public concern about hazards from chemicals in foods forced Congress to deal with the safety of ingredients when used in processed foods, including animal drug residues in meat and poultry products. In 1967, the Federal Meat Inspection Act was amended to address the difficulties that had arisen in the inspection process. Known as the Wholesome Meat Act of 1967, it allowed states to conduct inspections of the nation’s meat. In 1968 poultry inspection programs merged into one program within the Consumer and Marketing Service of USDA’s Agricultural Research Service. On October 26, 1971, the Animal and Plant Health Service (APHS) was created to administer all regulatory functions of the ARS, transferring meat and poultry inspections from the Consumer Marketing Service to APHS. 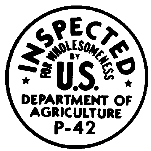 The agency’s name was changed to the Animal and Plant Health Inspection Service (APHIS) in 1972. On March 14, 1977, the Food Safety and Quality Service was established and took over meat and poultry products inspections from APHIS. On June 17, 1981, the Food Safety and Quality Service was reorganized as the Food Safety and Inspection Service (FSIS). In 1993, an outbreak of E. coli in the Pacific northwest, caused 400 illnesses and four deaths. Public advocates demanded increased safety measures for beef products, calling for a more science-based inspection system. At the time, the FSIS was relying on organoleptic inspections, which only involved checking by sight, touch, and smell. As a result, on July 25, 1996, the FSIS issued a landmark rule that it would require inspections based on the prevention and reduction of microbial pathogens on raw products using the Hazard Analysis and Critical Point system to inspect meat and poultry. Implementation of this rule began in 2000. The Food Safety and Inspection Service (FSIS) is responsible for ensuring the nation’s commercial supply of meat, poultry and egg products is safe from disease. The agency also works to ensure that meat, poultry, and egg products are labeled and packaged correctly to minimize contamination. FSIS uses scientifically based microbiological approaches to detect, understand and prevent food-borne hazards, including Salmonella, E. coli and Listeria. FSIS laboratories also use data collection and reports and risk assessments to guide risk-based inspection, which applies risk analysis principles to manage inspection programs. The agency also works with intelligence and law enforcement agencies to strengthen surveillance systems to detect intentional contamination of meat and poultry products. The FSIS currently uses three systems in its daily functions: the Automated Import Information System, which selects imports for additional re-inspection verification; the Consumer Complaint Monitoring System, which records consumer complaints about FSIS-regulated products; and the Performance Based Inspection System, which assigns in-plant inspection activities for FSIS inspectors and monitors performance profiles. The service also monitors recalls from federal-inspected firms that produce meat and poultry products, and it carries out six different food safety education programs. GWA – Datatrac Fast LLC, the agency’s largest contractor, provides secure ID card solutions, contact centers, information technology, and operations support. In addition to its contracting, GWA Datatrac Fast also received about $19.6 million in direct payments from the FSIS from 2002-2011. Other direct spending in this period went to the Department of Labor ($23.7 million), GSA Feds and Mpol ($9.5 million), General Dynamics Information Technology Inc. ($8.9 million), and about $7.9 million to non-federal vendors. In total, the FSIS spent nearly $276 million on direct payments from 2002-2011, according to USAspending.gov. FSIS also spent nearly $72 million on grants from 2002-2011, according to USAspending.gov. Officials with the FSIS cited problems with a store chain’s meat processing and bad recordkeeping following a salmonella outbreak in December 2011. Hannaford Supermarkets were forced to issue a recall of all ground beef with December 17 sell-by dates after a rare strain of salmonella was found in some of the meat. The recall impacted stores in the Northeast, where at least 14 people became ill from the beef. The FSIS complained Hannaford’s “limited records” hindered the agency’s ability to determine which supplier had provided the contaminated meat to the stores, although Hannaford met the basic record-keeping requirements. Agency officials also criticized Hannaford for using “high-risk practices” when grinding beef (using trimmings in the ground beef, which is perfectly legal), saying that habit also was making it harder to complete their investigation. Meat products in grocery stores baring the “natural” label are not as natural as consumers might think. Labels like “100% Natural” or “All Natural” do not refer to how a cow, chicken, or pig was raised or what it was fed. Instead, the FSIS authorizes such labels according to how an animal was processed, after it was slaughtered. If the meat was “minimally processed with no artificial ingredients,” then it qualifies as “natural,” according to the FSIS. The agency has admitted people get confused by the meaning of the labels. But it won’t change the system. A few years ago, it considered using “Naturally Raised” as a label in stores. But consumer groups complained such a move would only make things more confusing for consumers. Voted the 10th most significant food story of 2011, the FSIS decided to lower the cooking temperature for pork from 160° F to 145° F. FSIS officials said their recommendation was in line with suggestions by cookbook authors and chefs. Under the new guideline, pork should be allowed to rest for three minutes after it reaches 145 degrees. This should kill off any harmful bacteria, officials said. One chef, Jacques Pépin, said that the 145-degree recommendation could be applied to leaner cuts like pork loin, but not fatty portions like pork belly, pig’s head, or pig’s feet, which require longer cooking times. With thousands of Americans at risk each year of food poisoning, the FSIS decided in 2011 to ban six additional strains of E. coli from the nation’s food supply. Until then, only one form of E. coli (H7:O157) was illegal, which came about after an outbreak of food poisoning at Jack in the Box restaurants in 1994. FSIS said it was taking action against what it called the “Big Six” strains of E. coli because they caused about 40,000 illnesses, 1,100 hospitalizations, and 30 deaths annually. The FSIS has largely abdicated the responsibility of inspecting slaughterhouses to companies, resulting in millions of pounds of meat being recalled and hundreds of Americans getting sick. In 2010 alone, nearly nine million pounds of meat and poultry were recalled by 21 companies after the potential for food-borne illness was suspected. Five of the recalls were linked to 312 illnesses reported around the country. Since 1996, the FSIS checks with slaughter and processing plants to make sure they have Hazard Analysis and Critical Control Points plans. But the agency does not personally inspect the meat and poultry coming off the lines. Instead, company inspectors try to visually spot any signs of contamination. This task has become especially difficult because of the speed at which plants process cattle, chickens and pigs. At poultry plants inspectors can have as little as two seconds to review each carcass, while beef inspectors have between six seconds and 20 seconds. In January 2008, CNN reported that the Humane Society of the United States had released a video showing workers mistreating “downed” (cows that can’t walk) cows at a California slaughterhouse. The video was shot by an undercover investigator and showed workers administering repeated electric shocks to cows too sick or weak to stand on their own. The meat from these cows was part of the National School Lunch Program and presented a widespread health problem to consumers. Several U.S. senators sent letters to the head of the Food Safety and Inspection Service asking for an immediate investigation. Earlier that year, CNN reported that 143 million pounds of beef were being recalled–the largest in U.S. history, because “downer” cows were not re-inspected after becoming immobile, despite a USDA requirement that cattle must be able to walk to slaughter as a precaution against mad cow disease. In May 2009, Valley Meats LLC of Coal Valley, Illinois, recalled nearly 96,000 pounds of ground beef products because they may have been contaminated with E. coli after three people fell ill in the Cleveland area. The case was similar to a November 2007 case in which the American Foods Group had voluntarily recalled 96,000 pounds of ground beef products after two people were sickened, possibly by the E. coli bacteria. The Food Safety and Inspection Service reported that the beef products were sent to retailers and distributors in Indiana, Kentucky, Maryland, Ohio, Tennessee, Wisconsin, and Virginia. The products were subject to recall and consumers were urged to throw them out if found. In April 2007, CBS reported that the United States had banned melamine, a plastic found in pet foods imported from China. In the wake of the pet food contamination scare, China agreed to allow inspectors to help investigate the source of the contamination. Some of the contaminated gluten found its way into pet foods that were sent to hog farms in as many as six states. An FSIS spokesman said that all of the meat involved was under control, even though the Food and Drug Administration said that the urine of some of the hogs had tested positive for the chemical melamine. It was unclear as to whether the contaminated hogs had entered the human food supply. Former USDA inspector Patsy McKee successfully sued the Global Food Management Corp., and was awarded $739,000 and attorney fees for libel and slander. McKee was fired by the FSIS in 2000 after she documented the failure of several plants. During her tenure, the FSIS and USDA instituted a new inspection program that McKee said they only wanted positive results for. The policy was the government’s answer to a food poisoning incident at Jack in the Box in 1993, in which four children died and more than 700 people became ill after eating hamburgers tainted with E. coli. The Food Safety and Inspection Service (FSIS) implemented new rules in 2011 intended to end the inhumane treatment of animals at slaughterhouses. But episodes of animal cruelty were recorded the following year, raising doubts about the regulations’ effectiveness. Under the new rules, inspectors were required to ensure that livestock were exposed to a minimal amount of excitement, pain, injury, or discomfort. The regulations included a definition for “egregious inhumane treatment,” which was defined among other things as excessive beating or prodding of disabled livestock or using cattle prods to awaken animals. At least one California slaughterhouse was found in violation of the new rules in August 2012. An animal rights group recorded images at the Central Valley Meat Co. in Hanford, where cattle were repeatedly shot with a bolt gun, prodded to stand up, and hung in the air by one leg while still alive. The FSIS ordered the plant closed for several weeks, before allowing it to restart operations after the company reportedly made changes. The FSIS proposed new rules in December 2011 that would change its approval process for generic labels on food products. Under the new plan, companies could use new labels or modify existing ones without asking permission from FSIS. The change would also allow businesses to label a broader range of products without first getting the agency’s approval. FSIS officials insisted they would continue to verify that labels were accurate, not misleading, and in compliance with all existing labeling rules. Consumers would benefit from the reform, FSIS said, because it would mean getting new products faster into stores. At the same time, companies would enjoy a more convenient and cost-effective process. Twice in 2011 Senator Kirsten Gillibrand (D-New York) introduced legislation to improve the food safety system involving meat processing plants. Gillibrand introduced the Food and Drug Administration’s Food Safety Modernization Act in June that was aimed at reducing “all high-risk pathogens” and unregulated strains of E. coli in the nation’s meat supply so that fewer Americans were exposed to food poisoning. Among the changes sought by the Democratic senator was a requirement for slaughterhouses to twice test cuts and trimmings that go into ground beef. Another provision mandated American facilities certify that any imported meat be tested for E. coli. Also, slaughterhouses, producers, and grinding facilities would have been required to use independent testing facilities for checking meat. Later that year Gillibrand introduced more legislation designed to strengthen the role of the FSIS. The bill sought to broaden the definition of tainted meat, poultry, and egg products, and it called for criminal penalties for food manufacturers who knowingly sell contaminated products. The FSIS proposed a new regulation in 2011 that would require food manufacturers to more clearly inform consumers about additives in meat and meat products containing liquids. Oftentimes consumers are unaware, unless they read the fine print on packages, that meat, chicken, and pork products have been marinated or injected with water, salt water, flavorings and other additives, according to the agency. So the FSIS wanted food processors to use more prominent labels on products. The new rule would require a listing of the percentage of added solutions to meats as well as the ingredients in added liquids or solutions. The FSIS also proposed uniformity on labels as far as print size, type style, and color because, officials said, the change would make disclosures more noticeable to consumers. Catherine Woteki Sworn in as Under Secretary for Food Safety. Do you have an office in Mosell, Ms? If so, please give me the address. Thank you. what is your current position on "pink slime?" does the government plan to stop this process and get it out of our school lunch program, senior meals and our grocery stores? shame! seems like government for big business not for the people. Alfred Almanza, a career employee of the Food Safety and Inspection Service (FSIS), was appointed Deputy Under Secretary for Food Safety and acting administrator of FSIS in September, 2014. Almanza started with FSIS in 1978 as a food inspector in a slaughterhouse in Dalhart, Texas. From that entry-level position, Almanza worked his way up to labor management specialist, deputy district manager and in 2004 as district manager in the FSIS office in Dallas. Almanza’s work in Dallas impressed then-Under Secretary for Food Safety Richard Raymond and in 2007 he asked Almanza to come work for him in Washington as FSIS administrator. When Almanza was named deputy under secretary, he kept his responsibilities as FSIS administrator despite no longer having the official position. In 2015, Almanza instituted a new poultry inspection system that puts much of the responsibility for ensuring food safety in the hands of the processors, rather than the U.S. Department of Agriculture. He also consolidated food safety offices during his tenure, cutting the number from 15 to 10. Almanza and his wife Wendy have a daughter. He enjoys deer hunting. Brian E. Ronholm was named acting under secretary for food safety in the Department of Agriculture in December 2013 after the departure of Elisabeth Hagen, who went to work for Deloitte. Ronholm is responsible for the Food Safety and Inspection Service, which is tasked with ensuring that the nation’s meat, poultry and egg products are safe. Ronholm, a native of the San Francisco Bay area, was born in 1967 and attended Cal State Hayward (now Cal State East Bay), graduating with a B.S. in finance in 1990. He later earned an M.A. in public policy management from George Washington University in 1996. Ronholm left for the executive branch in April 2011 as deputy under secretary for food safety. When Hagen left in 2013, Ronholm took over the top food safety position. Some in the food industry expect that post to be filled on a permanent basis by someone with more of a health, rather than political, background. Ronholm and his wife, Michelle, a personal trainer, have one son, Nicholas.